I tell you, making dance costumes is challenging sometimes. I help out with my fourteen year old daughters school troupe costumes and of course, it's nothing like Studio costuming where everyone knows it's going to cost a bomb and takes out a second mortgage on the house to finance it. Everyone wants something that looks a million dollars for under $50 in school dance troupe. Seriously. And it's certainly the case with accessories for dance costumes, that we usually have to make do with very few of those fifty dollars. All the big money is thrown at the actual leotard bits, and headpieces are left to be put together by someone clever like me, who has a bit of imagination. I must admit I do love the challenge. So after a day of research and a brief that said 'French, Cancan, Parisian, Cute, Blingey, Feathery Beret', I came up with this idea. My fabulous and clever blogging friend Flora Fascinata, will be about fainting dead away at this point for she makes far more gorgeous things for people who have more than a dollar to spend. Sorry Flora, Sweetness. This little fascinator would get anyone through a costume party, dance recital or other occasion where a bit of fluff and nonsense on ones head is considered de rigeur. For any more serious event, I suggest visiting Flora. Some glittering Eva Foam or poster board coated with spray glitter, craft glitter or that really special German Glitter if you want to go all out. A CD to use as a template. A tiny bit of ribbon for the centre. Three ostrich plumes. Now I had an ostrich plume centrepiece for my Christmas table so I was fortunate to have some lovely plumes on hand. However I wasn't about to use them all on my one dollar fascinator, and my research suggested that three or more plumes were necessary to give my fascinator a bit of oomph. Well that wasn't happening from my centrepiece as my lovely plumes were more pricey than that thanks! So I used just one from my centrepiece, and bulked it out with...shhhhh... two plumes pilfered from my feather duster....hahahahaha! They were just the right size and length, and added a bit of light and shade to the plumage on my 'beret'. I simply used the CD as a template to cut out my beret shape, flipped it over and hot glued the plumes and a hairclip to the underside, and then glued my scrap of ribbon in place to give it a little 'French Beret' look. Here it is modelled by my daughters antique bed doll, Evangeline. Evangeline is not life sized though, so this will look smaller and cuter on the humans for which it is intended. And there it is. 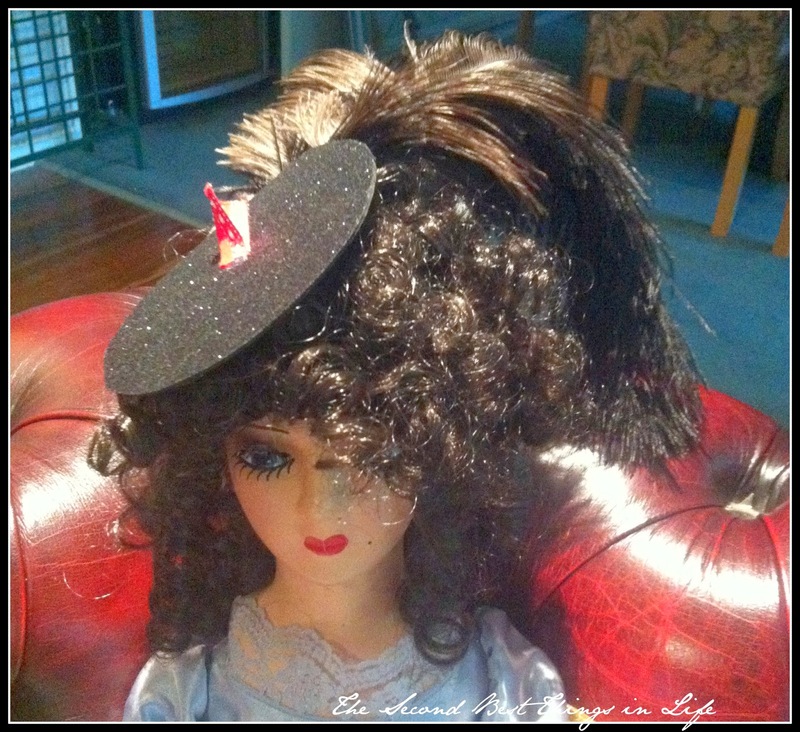 A glittering French beret inspired CanCan fascinator headpiece. Don't tell me it can't be done for under a dollar! 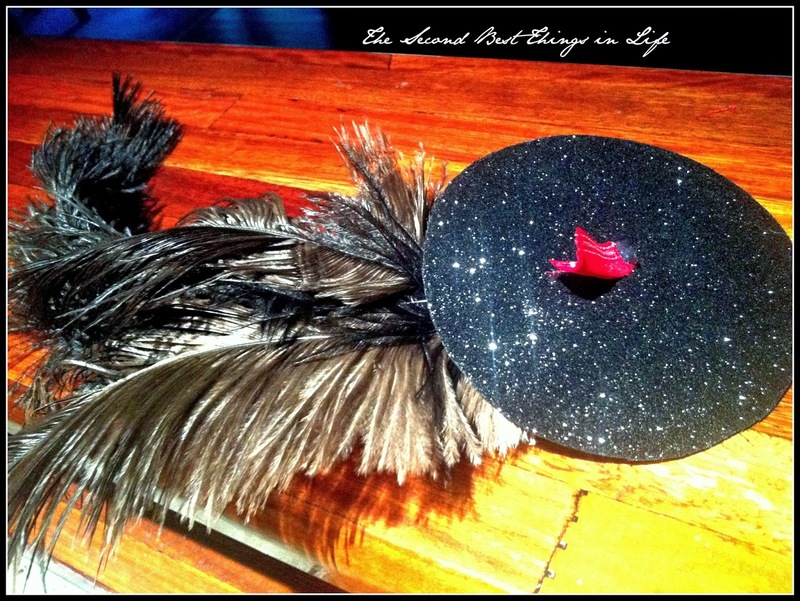 Feathers for my centrepiece sourced on sale from Feathers in Australia.